This post is also featured on the blog of the Jewish Community Federation and Endowment Fund. 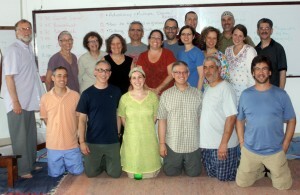 Marvin Goodman, far left, traveled with an AJWS rabbinic delegation to India. This July, I traveled to Lucknow in northern India with American Jewish World Service and a group of 17 rabbis from across the United States. Our goal was to personally see and understand AJWS’s important international work. And, as I look back at the trip, we certainly accomplished that—but we also got a more powerful crash course in the profound disparities between the conditions and expectations for human rights in the U.S. versus the developing world. The experience was overwhelming, surprising, uplifting, depressing and eye-opening. As part of our trip, we worked in Bikharipurwa, a small village without electricity or running water. At a school, we helped build a patio, where the students will be able sit at lunch time. We constructed a drainage channel near a water pump so that standing water would not collect and attract mosquitoes. We helped lay a cement floor in the school’s kitchen and in one of its classrooms. But, most importantly, we established relationships with the children and adults of the village. In many places around the country, we were struck by the relegation of women to lower status than that of men. Such customs and attitudes are, we learned, also a result of longstanding tradition and culture. Yet there are many exceptions, and we saw direct evidence of a gradual shift in Indian society. We met, for example, a woman named Kavita, an editor for a regional newspaper produced by Dalit women. She is changing attitudes and becoming a role model for the next generation of Indian women. In our eight days in India, we encountered much that was depressing, but we also learned about the power of local grassroots organizing. Organizations like AJWS are helping India transform itself by empowering local leaders and organizations to change India from within. Local people are making changes that impact their country—local people like Kavita, who inspired us greatly with her moral courage. You and I, living on the other side of the world, have the responsibility to do our part to enable the Kavitas of our world to create the changes that are so desperately needed in their backyards. What we do here can make a difference there. Consider getting involved in an organization like AJWS, which supports efforts to realize human rights and end poverty in the developing world. If you have the time, engage in the work that they do locally, and let your family, friends and neighbors know what you’re doing. If you have the means, donate so that they can continue to do their critical work. On September 5, the rabbis who traveled to India with me—along with Jews around the world—will be celebrating Rosh Hashanah, considered by some to be the birthday of the world. What an opportune moment for all of us to reimagine our world and to begin to take the steps necessary to change it for the better, to help create the world anew. I’d like to believe that this is the time for people like you and me to work together, in both a Jewish and humanitarian context, to create a world as we would like it to be. Marvin Goodman is executive director of the Northern California Board of Rabbis and a rabbi in residence with the Jewish Community Federation and Endowment Fund. He recently traveled with AJWS’s rabbinic delegation to India.